During the first and second world wars Wrights were one of the largest suppliers of military webbing in the country. On the 1911 census the term ‘khaki room’ can be seen frequently as additional information for Wright’s employees. This khaki rucksack was for use by the army. 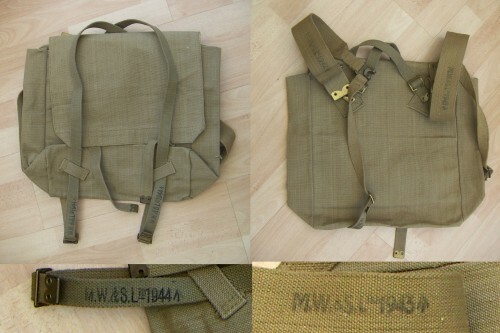 In this instance, the actual rucksack was made by a different manufacturer, but both sets of straps were made by Wrights and are marked as such. M.W.&S.LTD as stamped on the canvas, stands for ‘Michael Wright and Sons Ltd’. These particular items were ‘military surplus’. The markings would have soon worn off in active service.